In the late 1940s, when in my teens, I lived in Oakleigh Park, 8½ miles from 'The Cross' on the G.N. main line. A group of us railway enthusiasts would gather on the platform of an evening to socialise and observe the loco workings. Occasionally we would trip up to 'The Cross' and watch, amongst other things, the departure of The Aberdonian, the 7.00pm departure from platform 10 (as it was). 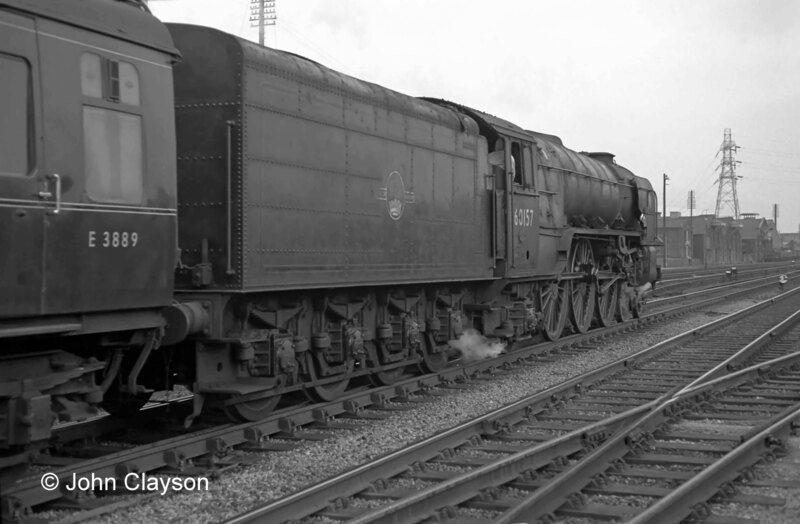 At the time this train and its locomotive were Grantham duties, either an A4 or a new A1, particularly one of the blue painted roller bearing fitted ones (60157 comes to mind). Class A1 No. 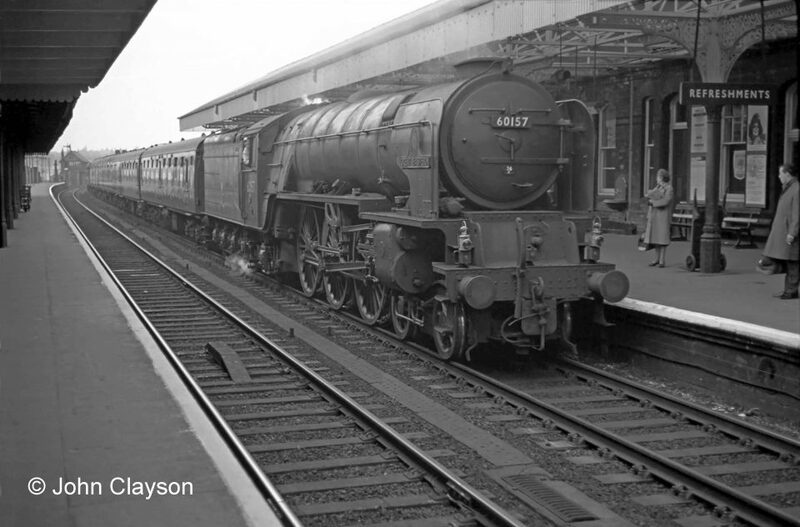 60157 Great Eastern departs from Grantham for the south on 9th April 1964. The photograph at the head of the page shows the train's arrival a few minutes earlier. One of our number knew Eric Neve (alias 'Wandering Willie'), an ardent and most knowledgeable observer of operating matters, and (at least) one of the Grantham top link crews. I cannot recall the driver's name but his fireman was Albert Bellamy, to whom I was introduced. Whenever we could we would find out what duty this crew was on and I would wait at the lineside somewhere - Oakleigh Park or Greenwood and, on one occasion, Doncaster - and wave to them. It gave me pleasure to know such a crew and to hail them with a friendly wave. Sometime in the late '40s while on a copping trip I found myself in Grantham and decided to try to bunk the shed. Not that I needed any Pacifics - they were already well copped from the London end, but I might have needed some of the smaller locos shedded there. So, dressed as usual in typical teenage clothing of the times (definitely non-railway), I left the station, walked under the bridge and ventured along the footpath on the Western side of 'the Loco'. Ah! But what is this approaching me? It was a rather tall "copper", all of 6ft with a tall helmet to add height. Needless to recount, he barred my way and enquired, in typical policeman tones, what I was doing there and where I was going. My reply was that I was hoping to see Mr Bellamy. That was obviously not good enough as no doubt he ascertained my intentions were to bunk the shed. He "invited" me to turn back whence I had come from and exit railway property forthwith! I don't recall ever subsequently bunking Grantham, alas! That, however, was not the end of the tale. It came back to me a week or two later via the Oakleigh Park grapevine that Mr Bellamy had been acquainted with the news that I had been hoping to see him. Unfortunately, as I recall, I never did meet Albert Bellamy again so was unable to apologise for any embarrassment caused to him. But the memory of that day has stayed with me for the past 65 years. Oh! Happy days of cop-lobbing on the LNER. Albert Bellamy was Grantham's shed foreman in August 1963. 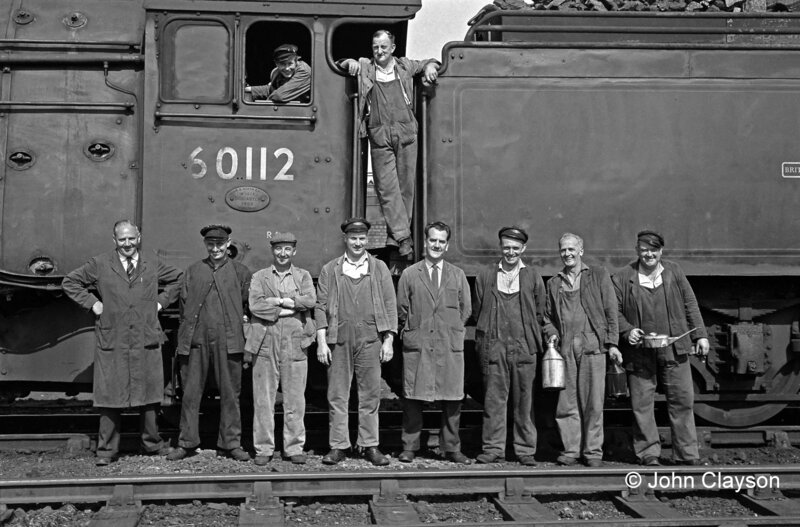 He is standing on the left of this group of shed staff and footplate crew.